TJ's videos have attracted the attention of several local media venues, including the editor of the Mooresville Weekly and the Huntersville Herald, the producer of the Charlotte Today show on WCNC 36, as well as Duncan McFadyen of WFAE radio. He also made an appearance in an elevator documentary which was released in 2012 along with his friend and fellow elevator photographer Diesel Ducy. TJ made his radio debut on the "Morning Show" hosted by Duncan McFadyen. Click the photo above to listen to the interview. Documentary about the Elevator Community featuring Diesel Ducy was released in 2012. TJ appeared briefly in a scene riding an elevator with Diesel Ducy. Click on the link above to watch the film. 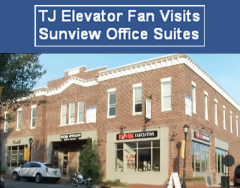 On a visit to Town of Baxter in Fort Mill, SC, TJ made a video of the elevator in the Sunview Office Suites building, which they featured on their website. 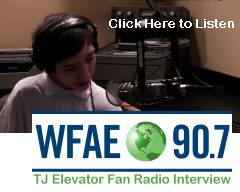 TJ Elevator Fan made the news when he was featured in the 09/16/2011 issue of the Mooresville Weekly. Click above to read the complete article. 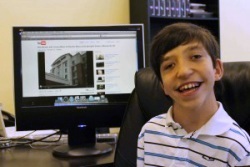 TJ was also featured in the 09/22/2011 issue of the Huntersville Herald. 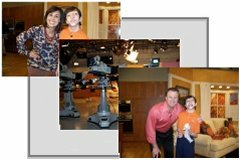 TJ Elevator Fan made his television debut on the "Charlotte Today" show on WCNC Channel 36! on Friday, September 30th, 2011. You can watch TJ's show segment by clicking on the link below.